Posted on February 17, 2015 by Ronald Patrick Raab, C.S.C. I hope you will take time during the Lenten season to listen to and pray with these Stations of the Cross. Andrew Noethe and I produced this set of stations a few years ago. Each station is a separate video. Andy’s brilliant photography speaks beautifully of people struggling to connect their story with the larger story of Jesus’ passion, death and resurrection. My prayer will be with you as you journey through these stations as we begin Lent tomorrow. The stations of the cross are a traditionally practiced prayer and meditation by which to view all human suffering. 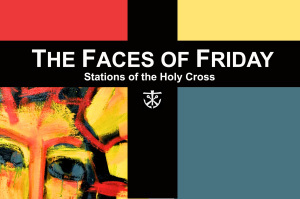 This version, The Faces of Friday, articulates the raw suffering we encounter daily at our parish here in Portland, Oregon. Before viewing, you are invited to read an introduction to The Faces of Friday from an article in Celebrate! Magazine. You can also read an article in today’s Catholic Sentinel about The Faces of Friday.